Sr. Annette will be attending the Assembly of the Congregation in Paris from April 5-15, 2019. Today she had the joy of attending the Celebration of the 120th Anniversary of Fr. Pernet’s death. April 3rd is also the date of his ordination. 1. The offertory procession had a photo of Fr. Pernet and Sr. Paul Helene who is the first martyr of Algeria and was recently beatified. Also were Flags of the countries where we serve and the bread and wine, symbols of our lives. 2. 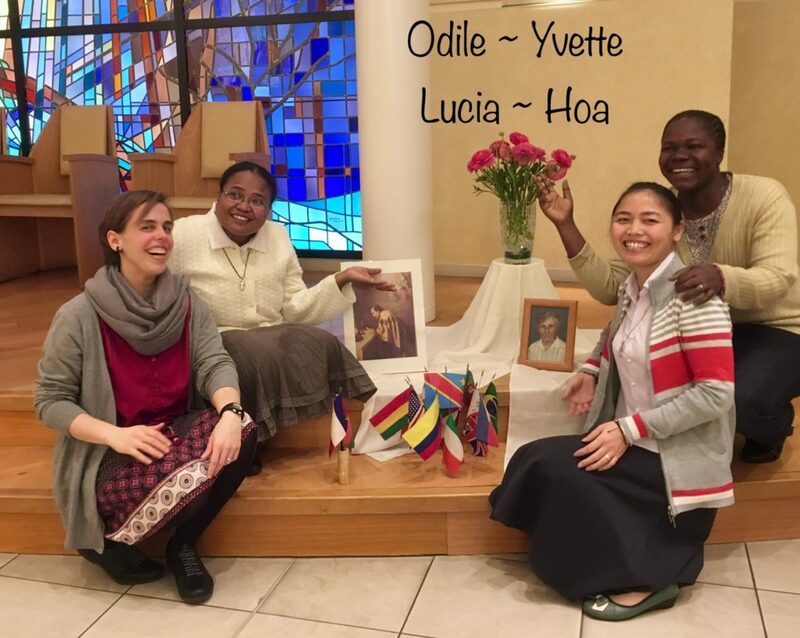 Since the beginning of January, four sisters are at the Mother House for the session of preparation for final commitment. Today, after communion, they were commissioned to new mission experiences for the next 2 1/2 months. Sisters Odile Ratiana from Madagascar will go to the community of Conflans Ste Honorine France; Lucia Uceda from Spain will go to Dong Hoa-Vietnam; Yvette Landa from the Democratic Republic of the Congo will go to Antony-France and Nguyen Thi Hoa from Vietnam will go to the Esperance Community Bobo Dioulasso in Burkina Faso. For sure they will continue to experience our internationality. 3. All those present at Mass sang Fr. Pernet’s prayer (My God, unite all minds in truth, and all hearts in charity.) in french.